With about 40 minutes left in the 6-hour practice, Buddy Lazier strapped into his entry for the first time this week. The No. 44 machine turned 1 lap. The first incident of the day came at the expense of Josef Newgarden. The newest Team Penske driver lost control of his No. 2 Dallara at the exit of Turn 1. The car snapped around, smacking the outside wall with the left side of his chassis. The car continued down the short chute, making light left side contact with the Turn 2 wall. Newgarden exited the car under his own power and has been checked, released and cleared to drive. Later in the day the track went yellow due to a large amount of smoke emitting from the No. 18 car of Sebastien Bourdais. It appeared to be an engine issue. 2,362 Laps were turned by 33 drivers. 15 - Castroneves - 240724. - Tony Stewart, who's foundation is working with Jay Howard's program for the '500' was at the track today. - With Stewart was Camping World Truck and dirt driver, Rico Abreu. - Red Hot Chili Peppers drummer, Chad Smith, was at IMS today as the band toured through Indianapolis. 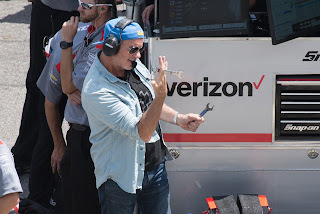 He spent a lot of time in the pit box of Team Penske's Will Power. Power is also a drummer.